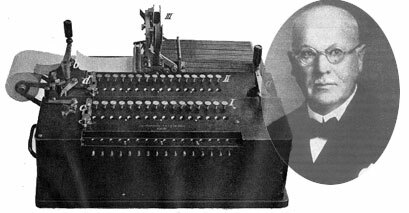 The German engineer Christel Hamann (1870-1948) (biography of Hamann) is remarkable figure in the world of mechanical calculators. He is a holder of many patents in this area and the constructor of countless mechanisms and calculators, let's mention only Gauss, Berolina, Mercedes Euklid, Hamann Manus, etc. In 1905 The Royal Prussian Academy of Sciences in Berlin placed a considerable sum (15000 Marks, later on Imperial Academy of Sciences in Vienna granted 8000 Krones) at the disposal of German professors Julius Bauschinger (Director of the Imperial Observatory of Strassburg) and Johann Peters (professor, assistant of the Royal Astronomical Calculating Institute of Berlin), in order to prepare and publish tables of logarithms to eight digital places of all numbers from 1 to 200000. 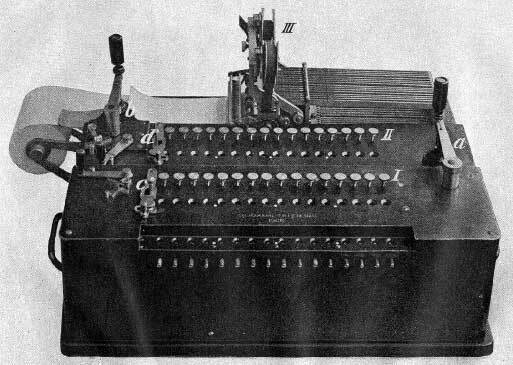 The work started using hand-calculations in 1908, and in the same year Bauschinger and Peters contacted Christel Hamann and asked him to put his long experience at his disposal and to construct a new machine, by means of which the values was to be reckoned from the second differences by summation and at once written down. Hamann accepted the challenge. Only several months were enough for the genius-constructor, and the machine (see the lower photo) was ready in the beginning of 1909. It immediately went into action, worked perfectly and surpassed all expectations. The machine (without printing unit) was 145 cm wide, 20 cm high and about 44 cm deep. Weight 40 kilograms. The machine consists of 3 parts: two similar independent calculating machines (adders), and a printing unit. Each of the two machines consists in turn of a switch and a counter. In the first adder placed next to the user the second difference is added to the first difference. With the second added in the middle part this sum is added to the intermediate result, while the third section, the printer, prints the result onto a strip of paper. All differences and the result can be set, operated and printed with sixteen places. Each of the 2 adders is driven by its own handle. The Tables of Bauschinger and Peters (Logarithmic-Trigonometrical Tables with eight decimal places from 1 to 20000) was published in Leipzig in 1910. A description of the machine of Hamann can be found in the preface of the book, click here to see it. (digitalized in PDF format by Stephan Weiss, www.mechrech.info).